This extremely useful book was written with the purpose of not only explaining the formation and function of all parts of the Scottish Gaelic verb, but also to go beyond the frequently terse descriptions given in most course books. It is packed with step-by-step explanations, numerous examples in a wide range of registers, and copious notes. Within its covers you will find help with all those aspects of Gaelic verbs which can be so troublesome to learners, including Verbal Nouns, the Assertive Verb, Defective Verbs and Irregular Verbs. In addition, while perusing it, the student may glean much incidental vocabulary, grammar, and sound examples of usage. Born in 1936 in Campbeltown, Colin B. D. Mark was raised in the North-East of Scotland. He was educated at Peterhead Academy and subsequently at Aberdeen University and at Aberdeen Teacher Training College. He worked in the field of Primary Education in various parts of Scotland over the next thirty-nine years. In the winter of 1975-76 he fulfilled a long-held desire to study Scottish Gaelic, and attended an evening class in this language. He quickly developed such an interest in Gaelic that he wrote the first edition of this book on the subject of Gaelic verbs. Thereafter he devoted much of his spare time over the next quarter of a century to the compilation of a modern Gaelic-English dictionary which was published shortly after his retirement. During this period he also had four short stories published in the all-Gaelic quarterly magazine Gairm. 'Colin Mark can only be thanked for his hard work in bringing this book out again, and adding to it ... for those who have been involved with Gaelic for some time, and who want to be sure that their speech and grammar are as accurate as possible (and doesn't that include fluent speakers who work professionally?) it has some extremely useful information'. -- Raghnall MacilleDuibh, An t-Albannach. 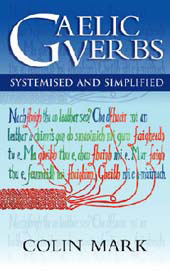 'Gaelic Verbs, by Colin B.D. Mark, provides both the newcomer to Gaelic and the seasoned learner an immensely varied and immediately useful set of maps into the heart of the all-important Gaelic verb.